The Times’s analysis estimated the size of the online donor armies for current and potential candidates by comparing hundreds of millions of dollars in donations processed through ActBlue. The analysis does not include candidates who have not run for federal office, such as mayors or governors, nor those who did not use ActBlue. To get a sense of scale, if Mr. Sanders’s 2.1 million donors constituted a city, the closest approximation would be to Houston, the country’s fourth-largest by population. For Mr. O’Rourke, it would be Seattle (742,000). For Ms. Warren, Honolulu (343,000). Ms. Gillibrand would be Toledo, Ohio (271,000). Ms. Harris would be Winston-Salem, N.C. (239,000). Senator Cory Booker of New Jersey, who entered the race at the start of February, would be Grand Forks, N.D. (56,000) — a sign of how Mr. Booker has not yet converted his vast social-media following into financial contributors. Former Vice President Joseph R. Biden Jr., despite being nationally known, would probably also begin far behind because he has not run for office on his own in a decade. His political action committee reported about $925,000 in donations of less than $200 since mid-2017, but since Mr. Biden does not use ActBlue there is no estimate of his number of donors. A spokesman for Mr. Biden declined to comment. Mr. Biden does have one unusual asset: access to the Obama campaign’s vaunted email list, which was 9 million-strong when turned over to the Democratic National Committee in 2015, according to the party. But email lists rapidly atrophy, and one that is seven years old is seen as a relative relic. Donors lists can take years to compile, and the biggest ones are often only developed through running a high-profile race. Email remains the dominant way to raise money online, and campaigns heavily advertise efforts like petition-signing drives on Facebook to harvest new donor email addresses. Those lists, in turn, generate volunteers and a network of potential supporters who can amplify candidates’ messages on social media to build further support. Grass-roots giving is seen as so important in 2020 that the Democratic National Committee has included it as part of its presidential debate qualification rules. Candidates are under intense pressure to lock down donors, big and small, in an already sprawling race. Whether small-dollar donors and larger bundlers give to multiple candidates or stay “monogamous” remains an open question, as Democrats have not had such a sizable field since the rise of online fund-raising. Of course, in a race likely to stretch over the next 18 months, early advantages can dissipate quickly. A strong poll or viral moment can prompt donors to give to new candidates, thereby growing their lists by huge numbers — so long as they are positioned to capitalize. Ms. Harris’s launch-day haul, for instance, rivaled that of Mr. Sanders in 2015. Both Ms. Harris and Ms. Gillibrand landed on the leader board despite having not faced a competitive election in recent years. The two senators spent heavily to bulk up their small donor lists, investing in multimillion-dollar campaigns on Facebook in 2017 and 2018 to add email addresses to their supporter list and lure in new contributors. While it is no surprise that Mr. Sanders is ahead with small digital donors — he is the only potential candidate to have a previous run for president included in the analysis — the sheer magnitude of his opening advantage is striking. Ms. Gillibrand actually had slightly more donors who were exclusive to her than Ms. Warren — even though she counted 70,000 fewer donors overall. 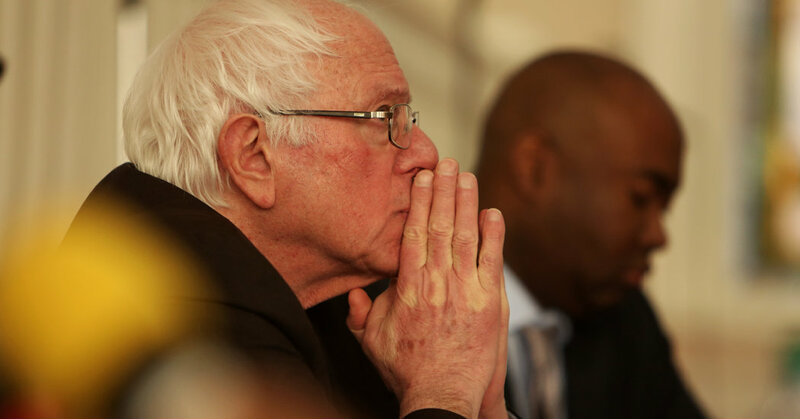 Critical questions remain about almost every candidate’s donor lists: Will donors to Mr. Sanders from his 2016 primary challenge to Hillary Clinton stick with him in a 2020 race with progressive alternatives? How much of Mr. O’Rouke’s flock were drawn to the chance to defeat Senator Ted Cruz, a favorite liberal villain? And how many of Ms. Warren’s boosters backed her against then-Senator Scott Brown but may not be on board for a run for the White House? Behind the top five candidates, Senator Sherrod Brown of Ohio, who is traveling through the early states as he considers a run, finished next with 114,000 donors. Next was Senator Jeff Merkley of Oregon, who was the only senator to endorse Mr. Sanders in 2016 and is now mulling a campaign; his 105,000 online donors suggest his fund-raising potential is relatively underrated. Mr. Booker is among the most widely followed potential presidential candidates on social media (he has 4 million Twitter followers) but the New Jersey Democrat had the seventh-most donors among senators looking at 2020 bids. Mr. Booker’s campaign website intermittently used ActBlue in 2013, 2014 and 2015, suggesting his full number of online donors is likely at least somewhat higher. Mr. Booker has announced that Jenna Lowenstein, a former top digital strategist for Mrs. Clinton’s 2016 campaign, would serve as his deputy campaign manager, a move seen as focusing on improving his online donor footprint. Senator Amy Klobuchar of Minnesota, who is expected to announce a 2020 bid on Sunday, lags far behind her colleagues, with fewer than 38,000 donors. That figure was about on par with Richard Ojeda, who briefly declared his presidential candidacy after losing a House race in West Virginia before abruptly quitting in late January. Representative Tulsi Gabbard of Hawaii, who announced her bid for president in January, had 41,000 donors, but more than 75 percent of her donors overlapped either with Mr. Sanders, whom she endorsed in 2016, or with at least two other potential candidates. Ms. Gabbard’s single best day for online donations came two and half years ago. That was the day Mr. Sanders sent a fund-raising email for her.